This one's mine. You'll have to make arrangements to get your own. Fortunately, that shouldn't be much of a problem this time around. Once the online Apple Store reopened this morning, the Air was available in both colors, all configuration. I had no problem with the site. The process was very smooth. The best part of the process is that you can make your purchase online, then pick it up from the Apple Store at your leisure. Even if there was a line around the block, and Apple ran out of supply, yours would still be ready for you when you got there. If you are planning to go this rout, do yourself a favor and backup your current iPad with iCloud. That way, you could bring your new iPad to the condition of your current iPad before leaving the store. If you don't want to leave the house, no worries. 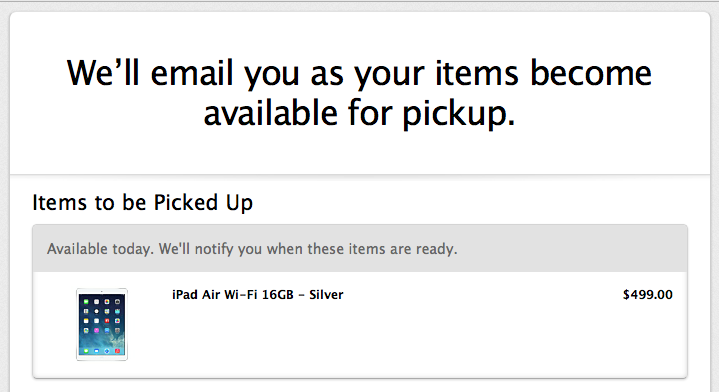 iPads ordered now are slated to be delivered on 11/4. Not bad at all. Look for my review this weekend.